Image: Installation of Susan Barnett’s “I Wear What I Want” exhibition at the University of Maine Museum of Art. 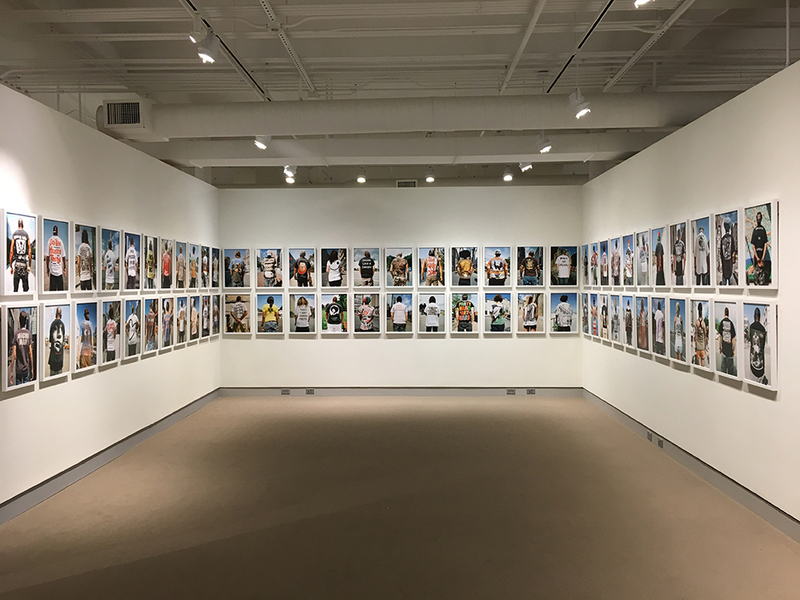 An exhibition of photographs by Susan Barnett, “I Wear What I Want,” opens at the University of Maine Museum of Art on Thursday, May 18, 2017. The photographer traveled the U.S. and abroad to capture intriguing individuals wearing an array of styles and catchy phrases that range from raunchy text to campy cartoon imagery. Not only vehicles of personal expression, these t-shirts exhibit messages that illustrate the complex polarities of thought currently existing within the nation. Many of the screen­printed shirts pictured in Barnett’s images are emblazoned with in-your-face language that convey a spectrum of beliefs; issues of race, unyielding politics, and religion are prominently featured in these collected images. Barnett’s subjects, bodies of all shapes, ages and sizes, are pictured from behind. The messages and graphics embraced by these individuals include celebrity idolization, sexual braggadocio, rebellious pronouncements and even nods to artistic masterpieces. The exhibition will be on view through September 2, 2017.